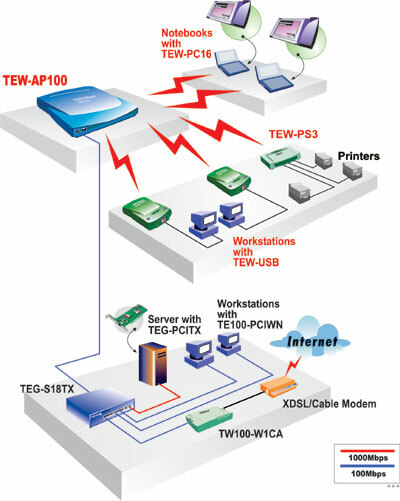 TRENDware's TEW-PS3 is a contribution to the fast and changing network technology. This Wireless Ethernet Print Server is designed to share three printers for the whole network environment without the hassle of installing cables or wires. Equipped with three IEEE-1284 compliant 25 pin parallel ports and multi-protocol support, you can set this print server anywhere in your wireless network to serve print jobs. TRENDnet's TEW-PS3 along with TRENDnet's Wireless PC Card (TEW-PC16), Wireless USB LAN Adapter (TEW-USB), and Wireless Access Point (TEW-AP100), you have all you need to simply create a wireless network - with coverage up to 300 meters!! Fast 11Mbps LAN connectivity based on IEEE 802.11b wireless high-speed standard. Bi-directional communication allows collection of information for attached printer's status. Distance coverage 35 to100 meters in closed environment; 100 to 300 meters in open environment. Integration Friendly: Supports IPX, NetBEUI, TCP/IP, and Appletalk protocols; you can easily setup the Print Server in almost every network environment. Flexible: Works in Ad-Hoc Wireless LAN mode or in Infrastructure Wireless LAN Mode, the Print Server can be implemented any where in the network. Cost Effective: Implementing 802.11b wireless technology, save time and money for laying network cables. Performance: Performs high speed printing of 3 ports simultaneously.